Tonight I wanted to have a meatless dinner. As I looked in the icebox for inspiration, I remembered that Devin had sprouted some mung beans for me, and I needed to use them before they rotted in the container. One of my favorite uses of bean sprouts is fried rice- so that's what I made! 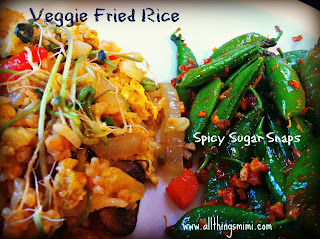 The thing I love about fried rice (well, I can say this about most things I cook) is that you can put anything in it. Fried rice is the ultimate ice box cleaner outer. 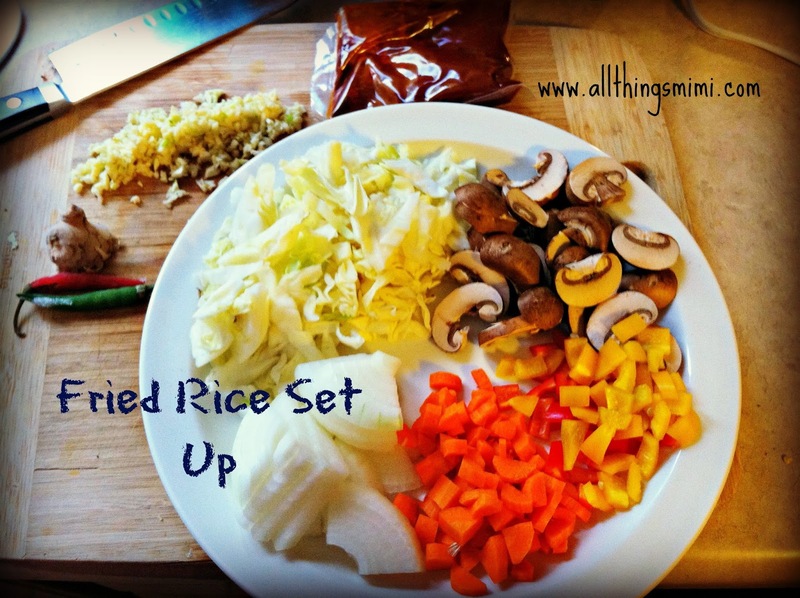 There are millions of ways to make fried rice. I do not make any claims of authenticity with this recipe. I bet I never do it exactly the same way twice. But I know that I've never made a batch we didn't gobble up. An important thing to know about fried rice is- always have everything ready to go before you even turn the heat on. This dish is easy to make, but once it starts, there's no time for chopping. I made a batch of rice in my rice cooker. I always make double the amount I need and freeze the leftovers. Having cooked rice in the freezer is like a get out of jail free card during the school year. I am never more than 15 minutes away from dinner if I already have cooked rice! To me, the secret to a good batch of fried rice is building layers of flavor. You can't stir fry everything then dump 2 gallons of soy sauce on it and expect it to taste good. So over the years I've learned a thing or two about the flavors I like and how to develop them. I make this in a non-stick skillet. Would it be easier in a wok-type pan? Yes. Do I have one? No. Sometimes life isn't fair. Before I turn the heat on, I put 2 tablespoons of coconut oil in the skillet. You can use whatever oil you like- canola, olive, whatever. To the oil in the cold pan I add about a tablespoon of fresh ginger (I keep a hand of ginger in the freezer at all times- I buy it at the grocery store, chop it into inch long pieces and put them in a zip lock bag), zested on a microplane grater (I don't even skin it); 2 Thai chile peppers, chopped, seeds and all (they aren't that hot); a tablespoon of minced fresh garlic; lemon grass paste (I get mine at the grocery store in the produce section); Thai red chile paste (you can get it at the grocery store in the Asian food section); and about a teaspoon of toasted sesame oil (also available in the Asian food section of the grocery store). Then I turn the heat to a little past medium. Don't touch anything until the stuff in the oil starts to sizzle. Once it does, use a wooden spoon or spatula and start moving stuff around. At this point, you are infusing that oil with all those yummie flavors. Let it cook for a minute or two- you don't want to burn the garlic. When the first layer of flavor is going, I add my veggies that take a few minutes to cook; I used half a chopped Vidalia onion, about 2 cups of chopped green cabbage, bell pepper (a little yellow and a little red), and chopped carrot. After those work for about 5 minutes, I add the sliced mushrooms. Let this go for a few minutes over moderately high heat. We want a little charring. I usually add a little soy sauce at this point, but not enough to make it wet- the stuff needs to stir fry, not boil. After a few minutes, I push the veggies to the side of the pan and make an empty space in the middle. I beat 2 eggs, then pour them in the middle of the skillet. Let them sit for a minute or two to begin cooking. Shake them around with the spatula to scramble them. When they start solidifying, stir the veggies back in. Let all that work over moderate heat. Again, you want the rice to char a little. Taste it and make sure it doesn't need a bit more soy, or something else. At this point you have a batch of fried rice that beats the heck out of any take out fried rice I've ever had. If you want to add meat to it, chicken and shrimp are excellent candidates, as is tofu. Tonight I made this and on the side I added an experiment. Earlier this week Devin and I had lunch at an Asian restaurant. We ordered the spicy edamame. To say it was good is an understatement. Angels sang.... the heavens opened up..... It was perfect! It hit me right in the umami sweet spot. It was spicy and garlicky and wonderful. I knew I had to figure out how to replicate the flavor profile at home. I decided to give it a whirl using sugar snap peas. The bonus being you can eat the whole pod. So the peas didn't turn out exactly, but they were really good. I blanched the sugar snaps in boiling water for about 3 minutes, then shocked them in ice water to lock the color and stop the cooking. I used the same pot I blanched them in to do the rest. Again, before I put the pan on the heat I added about 2 tablespoons of canola oil, lots of fresh minced garlic (like 5 cloves), some red pepper flakes (depends on how hot you want this to get) and about a tablespoon of the Thai red chile paste. I put the pan over moderate heat. After it started sizzling I stirred the spices around so the oil would soak up all the flavor. I let it sizzle about a minute (don't burn the garlic), then dumped in the sugar snaps. I threw them all around in the pan, letting them get coated in the spicy flavored oil. I stir fried them about a minute more- just to heat them through and coat them well. 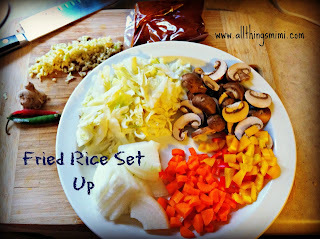 I immediately plated them with the fried rice and that was dinner!